Russia's Dzyuba fights for the ball with Kazakhstan's Logvinenko during their international friendly soccer match in Khimki outside Moscow, March 31, 2015. An experimental Russia side were held to a disappointing 0-0 draw at home to Kazakhstan in a friendly at the Khimki Arena just outside Moscow on Tuesday. Russia failed to test Pokatilov in the closing stages as Kazakhstan easily held on for a deserved draw against their more illustrious neighbors as whistles greeted the final whistle. 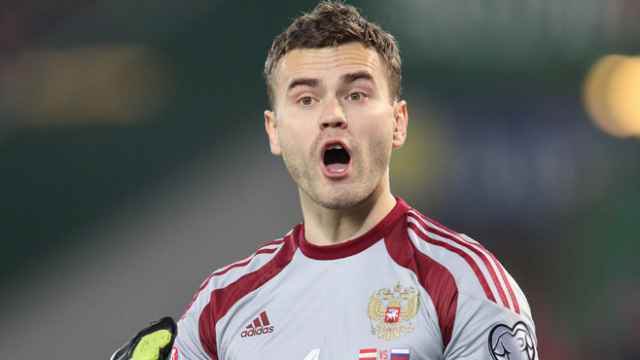 The game was first delayed by 33 minutes when Russia goalkeeper Igor Akinfeev was hit on the head by a flare soon after kickoff. 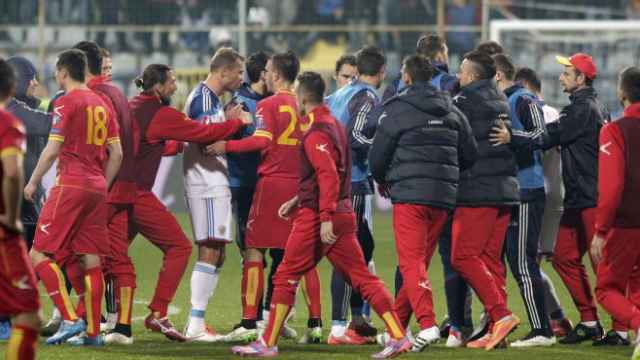 The Russian Football Union has launched a protest against the decision by UEFA officials to continue the Euro 2016 qualifier against Montenegro.